SkySafari 6 Pro will revolutionize your astronomical viewing experience. 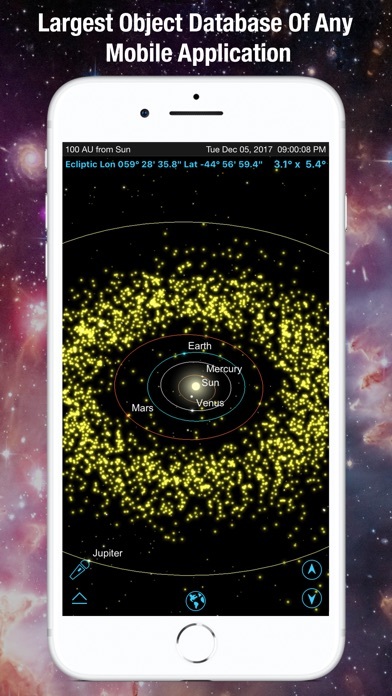 It has the largest database of any astronomy app, includes every solar system object ever discovered, offers unparalleled accuracy, flawless telescope control, Augmented Reality (AR) mode, and provides the very best experience under the stars when you depend on it. 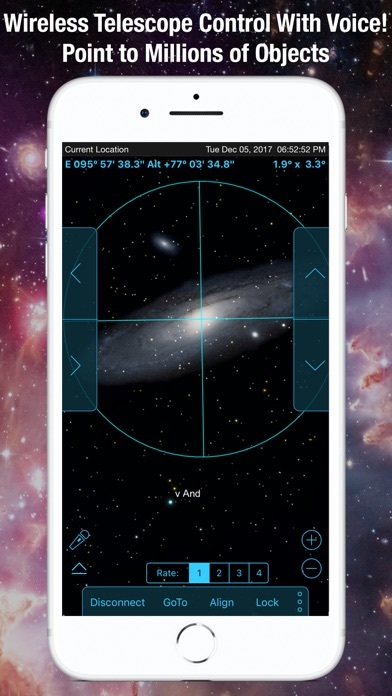 Discover why SkySafari 6 Pro is the #1 recommended astronomy app for serious amateur astronomers since 2009. Here's what's new in version 6: 1) Complete support for iOS 11 and iPhone X. We release regular updates. 2) Clouds and Astronomy. Two words that rarely go together. SkySafari 6 Pro will (optionally) back up all of your observing data in our secure cloud storage and make it easily accessible to multiple devices as well as from our new web interface, LiveSky.com. 3) We Have The Best Stars. Precise, modern and deep. We’ve updated our star catalog to use the latest and greatest, UCAC5 star catalog. If 25 million stars down to 15th magnitude isn’t enough for you, an easy in-app purchase gets you down to 16.5 magnitude and a whopping 100 million stars! 4) We Have The Best Galaxies. The PGC catalog includes galaxies down to 18th magnitude. Want more galaxies? How about 2.6 million more? An in-app purchase gives you access to the largest galaxy database available for your device. 5) Observers First. A redesign of our tools puts the active observer first. Quick access to features like your equipment, observing sites, lists, and observations make it easy and enjoyable to get out, observe, and record your observations. The observing sessions feature lets you collect your observations into groups that span a few hours, or a few nights. 6) Graph It. The completely new graph tool will give a quick visual representation of an object’s altitude above the horizon. Essential for planning your night’s observations. 7) Plan It. Make the most of your time under the stars. Our updated planner is a powerful tool that lets you create a list of targets for your observing session with filters like object types, specific time ranges, constellation, catalog, and more. Plan it and get more done. 8) Say It. Ever just wanted to just yell at your device and tell it what to do!? SkySafari 6 adds basic voice control for a wide range of operations. Say “select Jupiter,” “search for Titan,” “center on Polaris” and SkySafari will do the work for you. Yelling optional. 9) Tilt It. 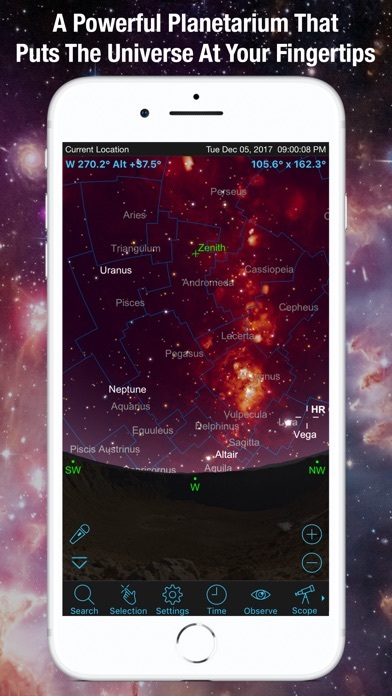 Every old astronomy app these days lets your tilt and pan your device to show different parts of the sky, but who else lets you control your telescope that way!? “Tilt to slew” is an optional mode allowing you to keep your eye in the eyepiece, and, using the accelerometers in your device, gently translate the movements of your hands into smooth telescope motion. 10) Share It. 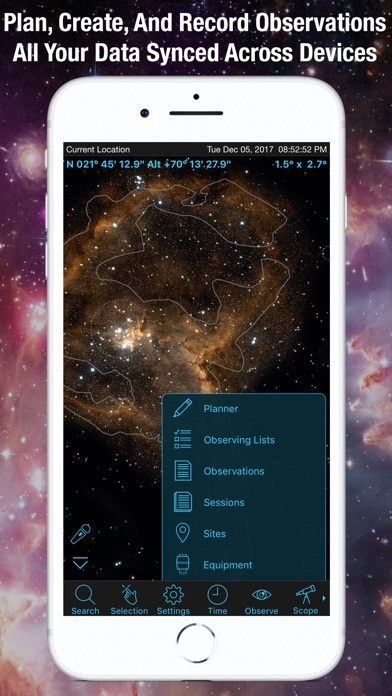 SkySafari 6 is more than just a mobile app, it’s a new system to help organize and share your observing experiences. With a free signup, you can see and share your observing data from our web portal, LiveSky.com! Affordable premium memberships add online editing, so you can not only view, but edit your observations, add new observing sites, manage your equipment and more. Finally, (coming soon) you can view, edit and manage your settings files with SkySafari Web, our fully functional web version. If you haven't used SkySafari 6 Pro before, here's what you can do with it: • Hold your device up, and SkySafari 6 Pro will find stars, constellations, planets, and more! 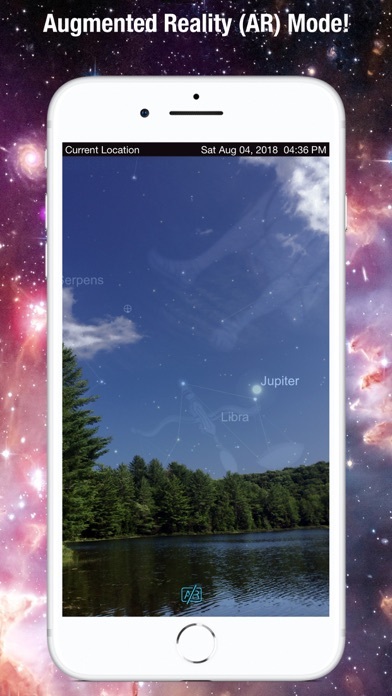 The star chart updates automatically with your movements for the ultimate stargazing experience. 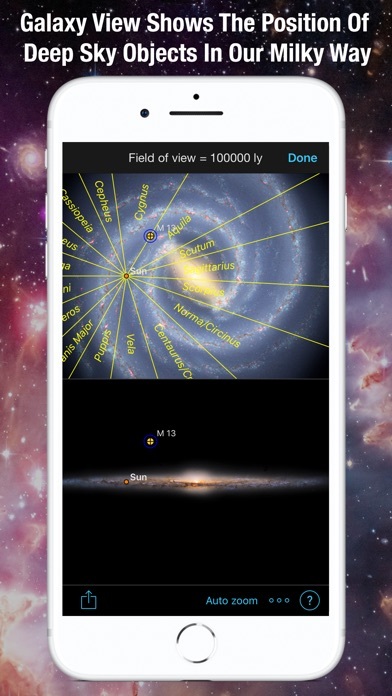 • Simulate the night sky up to 10,000 years in the past or future! Animate meteor showers, conjunctions, eclipses, and other celestial events. • Control your telescope, log and plan your observations. • Night Vision. • Orbit Mode. Leave the Earth’s surface behind, and fly through our solar system. • Galaxy View shows the position of deep sky objects in our Milky Way! • Much more! Works best on I-pad. This software has completely changed both observing and object planning for the better. There is simply no better alternative for locating objects and for selecting which ones to view and when. No other app offers as many features' there is simply no comparison. I have very mixed emotions about SkySafari 6 Pro. It’s feature packed and is a very capable iPhone/iPad planetarium program. The telescope control features work very well, and I’m able to interface to my Meade computerized telescopes through the Meade Stella wifi interface. But I had difficulty using the audio for the app, and discovered that the support for the product is very limited. When you try to call the company, there is no number to call for the iOS products. When you go to submit a service ticket online, you’re directed to the community bulletin board. So I submitted my problem online, and had no responses after 4 days. If the company is going to direct people to the community bulletin board, they should certainly monitor the board and provide assistance when needed. I finally figured the problem out myself. My experience with SkySafari 6 Pro is that it’s a 5-star product with 1-star support. That averages to a 3. It’s a feature-packed program but you might be on your own if you have a problem. Great graphics and it does an excellent job of controlling my iOptron scope wirelessly! Changed rating - still the best! Ok, I previously wrote a bad review.... but I was wrong. There is a big change/learning curve from v5 to v6.... they should do a better job of explaining the changes, but bottom line, this is the best app in its class, hands down! This is the app to have! Like most, I have several astronomy apps however this is without question my favorite and most useful. I have tried all the Astronomy software available on the iPhone. As a serious astronomer, Sky Safari stands above the rest. The observing lists are a strong feature to plan nightly viewing. This combined with WiFi control of my telescope means I can spend more viewing each night rather than fiddling with both my phone and the scope. Just added Celestron’s StarSense Autoalign to my Nexstar Evolution C8, SkySafari Pro (with Tilt) is a joy to use—I prefer using SSP for my observing over the Hand Controller.